The central point of any Catholic Church is the altar, at which the memorial of the sacrifice of Christ is celebrated. The base of the altar is of Portland stone and is the table of a previous altar donated by the mother of Canon Tom Lynch in 1955. From the earliest years of the Church, the Mass has been celebrated at a fixed altar where the relics of martyrs or other saints have been placed [Canon 1237 §2]. Following this tradition, the relics placed underneath our altar are of St Philip Howard, one of the English Martyrs, who died in the Tower of London and St Francis Xavier, the great Jesuit missionary to the Far East. The Blessed Sacrament is reserved in the tabernacle behind the altar to take Holy Communion to the sick. The tabernacle sits on a column of Aberdeen granite with a base and capital of Cheshire sandstone, which were donated by the family of Fr. Murphy, a previous Parish Priest. Our silver and gold plated altar candles were made at the end of World War I by Caustins of Camberwell. In addition to these we have a pair of brass candlesticks for use in the proclamation of the Gospel. These were given by Fr. McKenna-Whyte. The Easter Candle and the four large candlesticks behind the altar were carved to match the altar candles in 1990. The oak structure, called a ‘dossal’ (from the Latin word dorsal, meaning back) behind the altar and tabernacle is surmounted by two hand-carved and gilded angels which come from Poland. From this dossal hang the curtains which change with the different liturgical seasons. The large sanctuary Crucifix was regilded under Fr. Murphy's instruction to match the flanking angels. This crucifix is thought to be the work of the 19th century Ferdinand Stűflesser and was provided by Fr. Nugent who had been Vicar of St Martin’s in Brighton, where a similar crucifix can be seen to this day. Fr. Nugent also donated the statues of Our Lady and St John on the left and right of the sanctuary. These are thought to be 19th century European work and were originally designed to be hung at a higher level. The pulpit and altar rails were carved by Tudor of Liverpool in 1990. The pulpit base is Cheshire sandstone carved in 1990 at Hale village outside Liverpool. The chandeliers and other wrought ironwork in the church were cast by Tim Hallett, the blacksmith in the same village. The beautifully carved Stations of the Cross around the walls are identified by Ormsby of Scarisbrick as the work of Ferdinand Stűflesser the younger and were donated by Father Nugent in thanksgiving for his silver jubilee of ordination, and shortly before his death in 1948. On the right hand side of the sanctuary is a statue of the Sacred Heart, donated by parishioners in 1945 to replace an original which was shattered when a bomb fell at the end of the road on the Feast of Sts Peter and Paul, 29 June 1944. Down the right hand side of the church is the World War One memorial and beneath is a plaster of paris bas-relief of St Martin of Tours dressed as a French cavalry officer. Beneath this is a memorial book showing details from the Commonwealth War Graves Commission, marking the last resting places of those listed in our memorial. Under the gallery is a statue of St. Therèse of Lisieux given to the church by Monsignor Vernon Johnson, a contemporary of Fr. Nugent. Under the gallery, on the left hand side of the church is a wooden statue of St. Jude of unknown provenance and date. Behind St. Jude is a small statue of St. Anthony of Padua. Statue of St Joseph Opposite St. Anthony is a statue of St. Joseph by the late Philip Lindsey Clark. 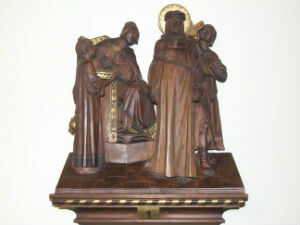 This wooden polychrome statue is unusual in that it shows St. Joseph as a young man. The statue in the Lady Chapel is a 19th century replica of the medieval Our Lady of Evesham wearing a brown tunic. The stained glass windows are in honour of Our Lady of the Nations with images from Walsingham, Haiti, Vailinkanni and Guadalupe, with names of deceased parishioners worked into the floral theme. The icon of Our Lady of Czestochowa, originally the gift of Polish parishioners after World War Two, was restored recently by the gift of Mavis Green, a Jamaican parishioner, completing the international theme of the Lady Chapel. To the left of the icon is a statue of the Infant of Prague, donated by Fr. McKenna-Whyte in memory of his mother. Print of the "Adoration of the Mystic Lamb"
In the gallery there is a copy of the “Adoration of the Mystic Lamb” by Van Eyck; this fine print was made by the Arundel Society in 1870. On the opposite wall is an unusual crucifix by the Ukrainian artist William Kurelek who lived in the parish in the 1950s. Dominating the front of the church is the largest of the windows. This was made by Susan Ashworth for the centenary of the church in 2004 and is a powerful and dramatic representation of Jesus the Divine Mercy as seen in a vision by the Polish St. Faustina. All the other glass has been made by Andrew Taylor. The next church window on the left contains images of Sts. Thomas More and John Fisher taken from their portraits by Holbein. Above the pulpit is an evocation of the Christmas Crib. On the left of the sanctuary are images of St. Simon and St. Jude. On the right of the sanctuary is an image of the Good Shepherd. Above the sacristy entrance is an image of Our Lady of Lourdes. The final image is of the Crucifixion with various events of the Way of the Cross. In the porch glass are the coat-of-arms of Pope John Paul II and Archbishop Michael Bowen with many images of saints, ancient and modern, including St. Francis Xavier and St. Philip Howard whose relics are buried under our altar.